Rahila Gupta meets the Rojava women fighters. They are helping to stop ISIS and also leading a democratic fight against capitalism. A small area on Syria’s northern border with Turkey is now unique. This is the most radical experiment in democracy and gender equality, not just in the Middle East, but in the whole world. Western Kurdistan (or Rojava, ‘the land where the sun sets’) was first in the Western news when Kurdish women fighters freed Yazidi women and children from ISIS on Mount Sinjar in August/September 2015. The US, the Free Syrian Army and the other regional armies in Iraq together could not stop the advance of ISIS. But young women in military clothes and flowery scarves were stronger than the men who do not like women even when they cover up. These were strong images. But capitalist consumerism tried to control them: H&M tried to sell clothes based on the women’s uniforms. The Kurdish community were very angry at this because it made their fight look unimportant. So who are the YPJ (Women’s Defence Units), and what kind of society are they defending? They had two main inspirations: Abdullah Öcalan (the imprisoned leader of the banned PKK - Kurdistan Workers’ Party - in Turkey) and the ‘Arab Spring’. The Kurds of Rojava began their fight for autonomy in 2011. Their autonomous self-administration started in November 2013. Öcalan is not like all other male freedom fighters. He put women at the centre of his vision of a liberated, democratic society. His system is co-presidentship, with a man and a woman sharing power at every level. The chaos in Syria created a political vacuum so this experiment is continuing here. In southeastern Turkey, the Turkish government have controlled similar plans with physical force. The YPJ, probably about 7,500-10,000 people, is not the same as the Peshmerga army of the Kurdistan Regional Government across the border in Iraq. The People’s Protection Units (YPG), men and women, works closely with the military wing of the PKK and is also part of a new force, the Syrian Democratic Forces, (groups of Arab, Assyrian, Armenian, Kurdish and Turkmen militias, fighting against ISIS and other Islamists in the Syrian opposition). 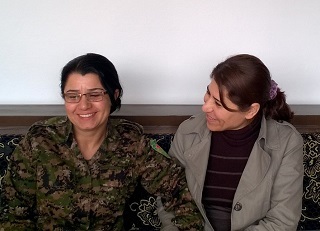 When I visited Rojava I met Nesrîn Abdullah, Commander and chief spokesperson of the YPJ. Nesrîn joined in 2011. ‘I had two reasons to become a fighter. The Assad regime was controlling us. This treated us badly both as Kurds and as women. If others invade your land, they also invade you as a person. As women we had to start a defence force to protect ourselves; not only a military force but also a political and ideological force. Without this, there will be no social and political equality between the two sexes.’ At 37, Nesrîn is part of a generation of Syrians that had military training at school aged 13 to 16. 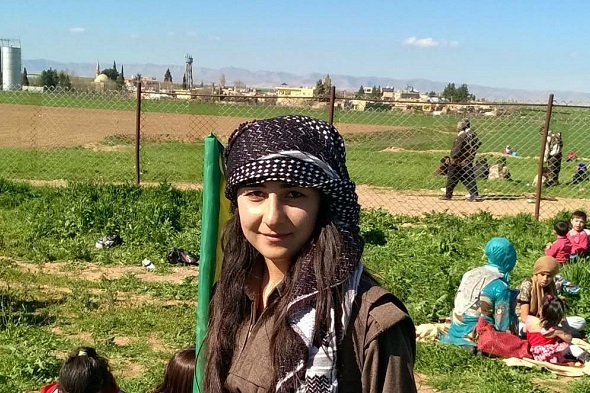 She then had a month’s training when she joined the YPJ. She commands men and women. The men are happy to follow her command, not like with the PKK women commanders in the 1980s and 1990s. The training tries to produce fighters with shared values. There is a lot of group criticism and self-criticism. People join for many different reasons: to defend the homeland; to free the people; and to escape poverty and, for women, conservative families. Fighters are not allowed to have sexual relations. If men treat women with violence, they are arrested. Men and women are allowed to get married, but the women then have to leave the force; this is only evidence of inequality I found – they say it is because of ‘our conservative society’. This can sound optimistic, but the YPG and YPJ have been successful in defending and also winning back land from ISIS fighters. ISIS fighters also have strong belief, but this is a medieval and twisted form of Islam. And belief is not the only drug that ISIS fighters have; they also take captagon (a form of amphetamine) to make them feel they will win. A wounded YPG soldier told me that he had found drugs on the ISIS fighters he had captured, he said that captagon stops them falling after they are shot. Money also makes them fight: now that they get less, because money from oil is less, they say ISIS fighters are not so happy to fight. Because they are the most effective fighting force against ISIS, they now have US air cover support. Turkey is not happy about this. But the anti-capitalist ideology of Rojava is almost more dangerous to the US than the religious fundamentalism of ISIS. The US has not been able to persuade Turkey and the Kurdistan Regional Government to stop the trade embargo on the Rojava. They cannot get building materials and medicines, so it is very difficult to develop, and many people suffer. Also, the US is refusing to support Rojava’s demand for autonomous federal zones as a solution to the Syrian crisis. When they do not think the Rojava are useful anymore, the US will probably say they are with the PKK and stop supporting them. We need to tell people that the Rojava are independent from the PKK. And we need to remove the PKK from the US list of terrorist organizations. Their leaders are not violent and the ideology includes a real grassroots enthusiasm for political change, and fighting for women’s equality. Rahila Gupta visited Rojava to research her book with Beatrix Campbell, Why Doesn’t Patriarchy Die? NOW READ THE ORIGINAL: http://newint.org/features/2016/05/01/rojava-women-syria/ (This article has been simplified so the words, text structure and quotes may have been changed). This page was last edited on 20 May 2016, at 13:29.